The directory lists production services and businesses that host production worldwide. Everything from actors to crew, animals and numerous local businesses. A film or television project may need all sorts of support. Catering, cars, locations, bars, accommodations, props, staging, photography, casting and everything else in between. You never know what a production may need to shoot the scene (s) or need to support the crew and the production company. 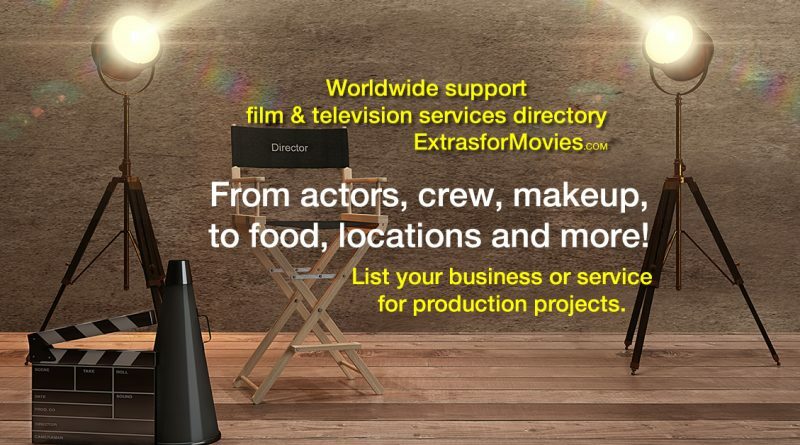 Extras For Movies has a new production directory. Work as a sub-contractor or offer your business services to the entertainment industry. Television commercials, short films, feature films and photography projects for advertising campaigns. The production directory is an avenue to get involved in the industry. Generate additional income and meet production staff who can use and recommend your talents and services to others. List your skills or service, and contact information in the production services directory where production personnel can review and contact you personally to inquire about your service. To get your information in to the directory see how to details below. Login after registration and click “List Your Production Service”. Select category production services, then sub category that best describes your service.